Hatters boss Nathan Jones is looking for his side to extend their lead at the top of League Two when they head to Cambridge United on Saturday. The Luton chief saw Town’s advantage over second placed Accrington cut to just three points last weekend, although they remained seven points ahead of Notts County in fourth. We’ve got a seven point gap, hopefully that could turn slightly more, it’s a good position. Wycombe Wanderers then fluffed their chance to join Stanley just three points behind, losing 1-0 at home to Coventry on Tuesday night, as Jones said: “We’ve got seven, plus a game in hand, so that could turn into 10 and you’ve got to keep trying to win your games. “We’re in decent shape, we’ve got to play good teams here. I prefer to play better teams here if I’m honest, because we both try and win the game. “So it’s a good run-in, we’ve got a seven point gap, hopefully that could turn slightly more, it’s a good position. “We’re in a better position than we were last year, much, much better, and we’ve got everyone coming back. “Danny (Hylton) will benefit from that (substitute appearance) we’ve got another week of training, we get a few more that will have another week and a game, so we’re in a good place. Although Accrington closed the gap by beating Cambridge 1-0 on Saturday, it didn’t cause Jones any undue concern, as he said: “You expect that, because if you don’t take advantage and they do then fine. 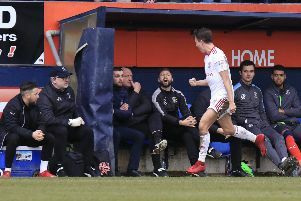 Jones felt that with a little bit more cutting edge at the weekend, they would have picked up victory number 14 at Kenilworth Road this campaign. He added: “We had good opportunities in the final third, we just lacked a bit of quality. “Every time we had an opportunity right in amongst the 18-yard, the ball was too far. “We were counter attacking first half and Harry (Cornick) pushes Olly Lee out too wide, that’s when you need that little bit of quality, that little bit of composure and that’s what we lacked.